Hey you! What’s this blog about? Hello and welcome to lisa.m, a blog I have created to display everything that comes to my mind! One key thing you need to realise when scrolling through this blog is that I am either utterly obsessed with something or not interested in the slightest. This well known-on-the-internet sketch is perfect for describing this state of mind. This is a bit of an affliction when it comes to say for example blogging. I want to write and write and write and write etc… when I start a blog but eventually I question my original determination and quit. This has been the case with everything in my life from violin lessons (where the teacher called my mum and told her to stop wasting her money because I clearly wasn’t interested) to that time I was going to make an Etsy store (but then realised materials cost a lot of money…and time…and effort – all of which I don’t have). So this blog will showcase whatever holds my interest at the moment. My previous blogs have been everything from a health conscious blog (don’t make me laugh Past Lisa) to when I become obsessed with beauty bloggers and tried my own but realised similar to previous Etsy situation I have no money for new make up. One time I started a blog trying to complete a bucket list but living in the middle of nowhere there isn’t much going on to fulfil a bucket list. My “most successful” blog (be v conscious of the inverted commas) was a blog I dedicated to finding a hobby. I really enjoyed that one but ultimately felt it was a little lacklustre, if you get me. So here I am with my millionth blog and honestly what will make this any different? 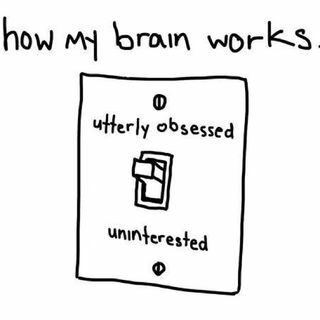 To be honest I haven’t a clue but my light switch is directed strongly at utterly obsessed (that sounds weird but you get me, right? ).